The productivity of an organization depends prominently on the efficiency of its employees. They form a crucial part of the business process by handling customer data and delivering services. For the employees to act promptly, they need to put lesser manual effort in data entry and find methods to handle their repetitive tasks effectively and efficiently. This aligns the business closely with its objectives. Inogic suite of Dynamics 365 CRM Productivity pack includes one such app which enables Dynamics CRM users to avail the benefits of copying/cloning records in just 1 Click. Yes, say bye to extra manual effort while dealing with duplicate data! Click2Clone allows cloning multiple Dynamics 365 records in just one click. It is easy to configure and can select fields that are to be carried over while cloning. It also enables users to clone relationships. This feature can be configured at the time of creating templates for entities and their hierarchies. Click2Clone copies/clones CRM records of both OOB and custom entities. For large data, cloning may become tedious by iterating the same process in batches. It exhausts time and effort. To counteract this we use workflow. Workflow is an automated method with a set of customized steps that clones bulk of data upon initiation in Dynamic 365. This leverages the productivity and makes data cloning even simpler within Dynamics CRM by optimizing the process. Click2Clone takes forward the entity relationships while cloning. This feature works for hierarchies and clones child records simultaneously. It saves effort which can be used for other priority tasks. This is a simple process but with multiple functionalities. To dig deeper click here! This solution supports various deployment models viz. On-Premise, Online and Partner Hosted. 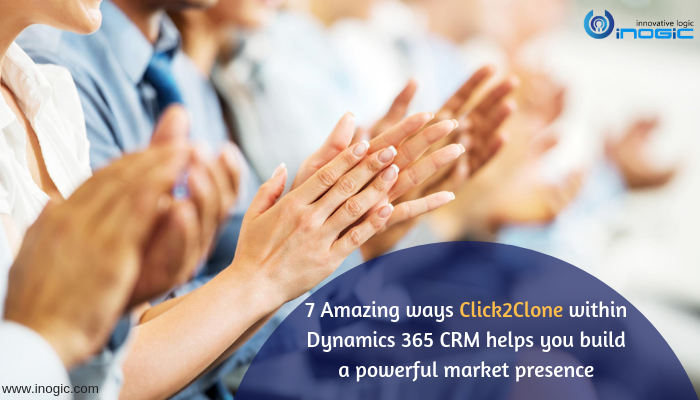 Copying bulk volume of repetitive data on Dynamic CRM has now become effortless with Click2Clone – cloning duplicate data within Dynamic 365 CRM. It is easy to configure and even simpler to access. As Click2Clone is an automated productivity tool for Microsoft Dynamics 365 Customer Engagement, it leaves no room for error. There is no redundant data that measures the productivity down. The consistency of cloned records in Dynamics CRM/365 allows organizations to provide consistent and dependable processes to customers thereby maintaining a competitive advantage. It reduces the manual effort considerably thereby augmenting the result. One can clone 100s of records in one click by using this solution. This leads to better outcome and elevates the entire business process. This enables users to waste no time in data entry and utilize it in maintaining customer relationship thus increasing the ROI. Our Dynamics 365 add-on Click2Clone is time and cost effective. It saves unnecessary effort and costs and becomes a strategic enabler of business control and agility. This enables cloning entities like Invoice, Quote, Order, Opportunity, Lead, Account, Contact, etc., thus boosting the business process within Dynamics 365. These were few pointers that defined how Click2Clone makes day-to-day task of cloning duplicate data easier. Try it for free for Dynamics CRM 2013 and above. It works for all deployment models viz. On-Premises, Online, and Partner-hosted. For free trial click here! In our next post we will cover one more of our Productivity App Click2Export which allows you to export your reports in just one click. We have given more power to Click2Export users by allowing them to create CRM Word Template and execute Workflow to automate the process.